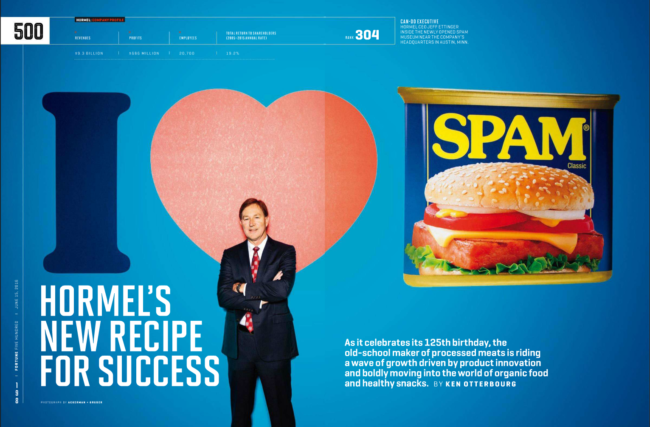 Heidi: Since you live in the SPAM heartland, how often do you enjoy it? 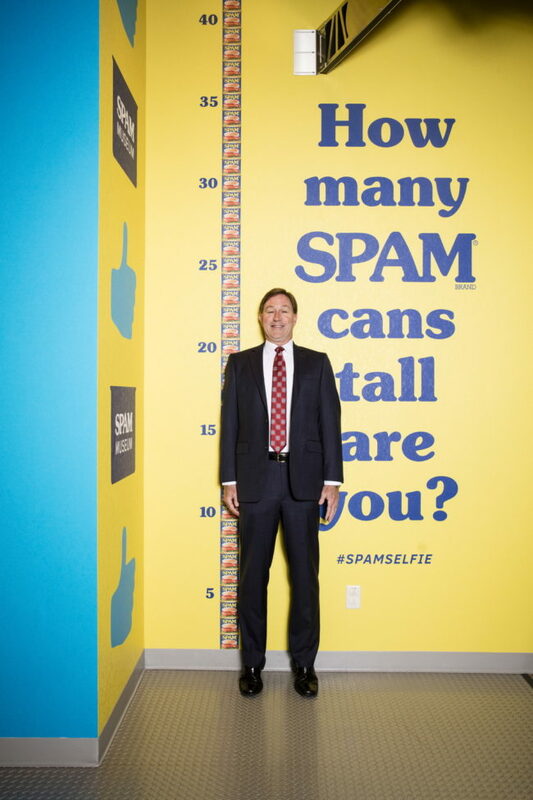 AG: Living in Minnesota, you would have thought we have had SPAM before. However, it wasn’t until last year when we were on a shoot in Hawaii that we finally did. How much time did you get for the shoot? 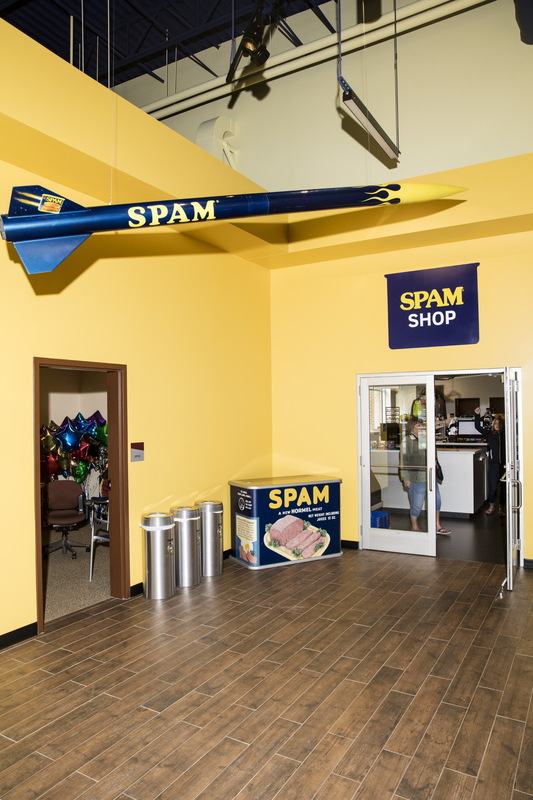 We spent a day in Austin, MN at both the Hormel campus and at the SPAM Museum. Since you had direct access to the factory, did you have to wear protective clothing. Unfortunately that factory shot wasn’t actually from the SPAM factory it was from a Skippy Peanut Butter factory in Arkansas and it actually wasn’t our photo. The SPAM plant wasn’t running when we were there as it was the time of the year where they shutdown the plant and do a deep cleaning of everything. Photographing in the SPAM plant would have been the only thing that would’ve made this shoot even more amazing. Nobody wants to know how the sausage is made unless it’s SPAM and then we are all game. What were the magazines directives? Michele Taylor, the photo editor at Fortune, basically said keep it colorful and quirky. This is always music to our ears. She wanted a combination of reportage, still-lifes and portraits of the CEO and president. It was the perfect combination of direction and freedom to explore. 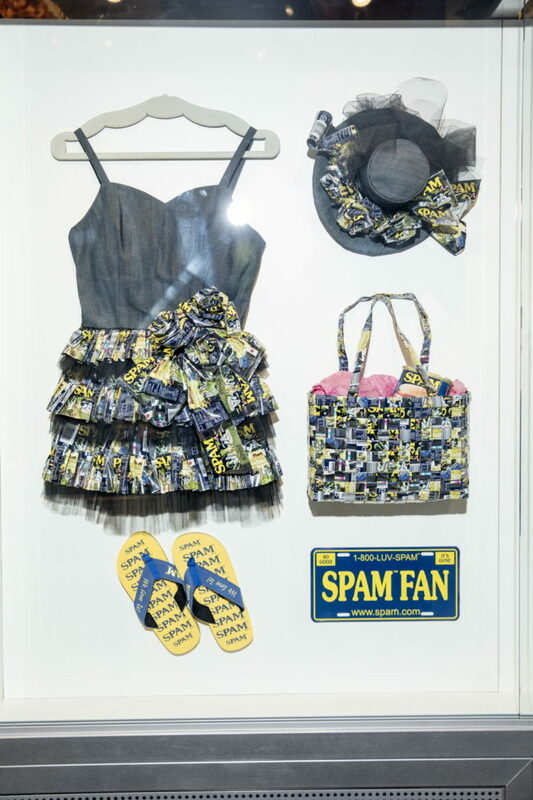 When you’re in the land of SPAM it isn’t difficult to find images that jump out to you. The shoot actually came together very quickly as the CEO and President were traveling for the next month so we got the first email from Michele on Wednesday afternoon and were shooting the assignment that Friday. Often in cases like this we find the PR person is the biggest hurdle we have to overcome. So we find that keeping an idea or two in our back pocket is best and then after we feel out our subjects we can tell them the idea directly and get them on board, which in turn gets the PR person to run with it. It’s such an iconic brand with a cult following what was your initial approach? We see SPAM as this kind of quirky larger than life brand so we wanted the photos to play off that idea and decided the images should be “poppy” to reflect that so we decided to use a direct strobe for the shoot. Not to mention we love the approach for shoots whenever it’s a good fit so that also made it a no-brainer. Are you both shooting all the time? It depends on the shoot. For a shoot like this we are both switching fluidly between roles as a photographer/lighting tech/subject wrangler, etc.. In the situation for the CEO portraits, Tim is setting up and dialing in the lights, while Jenn is working with the PR team to calm any fears they might have and assuring them everything will go smoothly. Once the CEO arrives Jenn might start off shooting, while Tim is fine-tuning the lights, monitoring the tethered iPad for any major issues and thinking of about the next scenario. Often times we’ll hand off the camera in the middle of a portrait session to get a different perspective and to keep things fresh for our subjects. For more of the reportage and still-life photos, one person is acting as the assistant and holding the light, while the other person is shooting. The person who is holding the light is also always scanning the scene looking for any other visual potential in the situation. Tim loves shooting quirky Americana things like this so he shot the majority of the day. Someone recently described watching the two of us work as one of the most fluid dances of creativity they have ever seen. It sounds cool so we won’t argue with them! We’ve been shooting together for so long now that we find we don’t even communicate verbally anymore and we already know what the other person is thinking and can be on the same page effortlessly. What are each other’s strengths or how do you complement each other. We find it’s an amazing luxury to be working as an husband and wife team and how much easier it is to break the ice and establish a rapport with our subjects. Often times we won’t know who the “main photographer” will be on a shoot until we meet our subjects and read how they respond to us. So sometimes that might be Tim and other times it will be Jenn, but more often than not we will both usually end up shooting. We find that one person usually has the art direction as their main focus and the other is free to explore beyond those restraints. We joke with people that our marriage is a breeze and that the only disagreements we have are creative differences when we are out shooting. It’s great though because we channel that energy and use it to push ourselves our creatively. The real fun starts when we get back to the office and and see who’s images spoke to us the most. Jenn is great at producing, scheduling and making sure people feel comfortable in front of the camera. Tim is usually the one setting up the gear, making sure the lights are dialed in and tackling any tech or logistical issues. Are you always shooting motion and stills? If the job calls for it we will. Otherwise we’re happy focusing on only stills. If a shoot happens to be a stills and motion project one person will focus on the stills (usually Jenn), while the other person focuses on the motion side of things (usually Tim). In the past we tried juggling the two between us both but found both mediums suffered so now we separate the roles so the outcome of both isn’t diluted. What documentary film won an Emmy? Our prison project Trapped won the Emmy. The project looked how a prison system deals with treating those who suffer from mental illness. It was by far the most intense project we ever worked on.